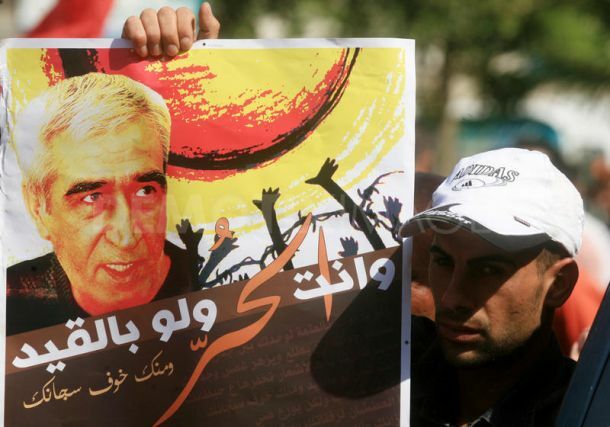 Ahmad Sa’adat, imprisoned General Secretary of the Popular Front for the Liberation of Palestine and Palestinian national leader, issued the following public letter to Lebanese Communist struggler for Palestine, Georges Ibrahim Abdallah, imprisoned in French jails for 34 years. 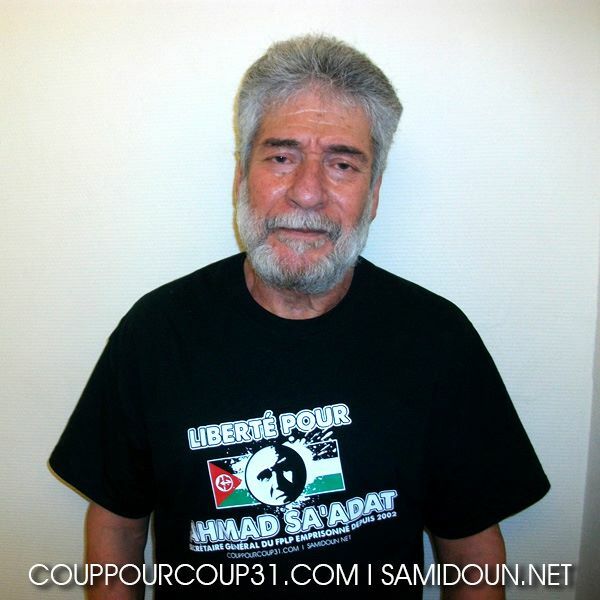 The letter comes shortly after a photo of Georges Abdallah in Lannemezan prison was released by Coup Pour Coup 31 and the campaign to free Georges Abdallah, wearing a T-shirt in solidarity with Sa’adat and demanding his freedom. It also comes as organizers are gearing up for the large national demonstration on 21 October outside the Lannemezan prison to demand Abdallah’s release. 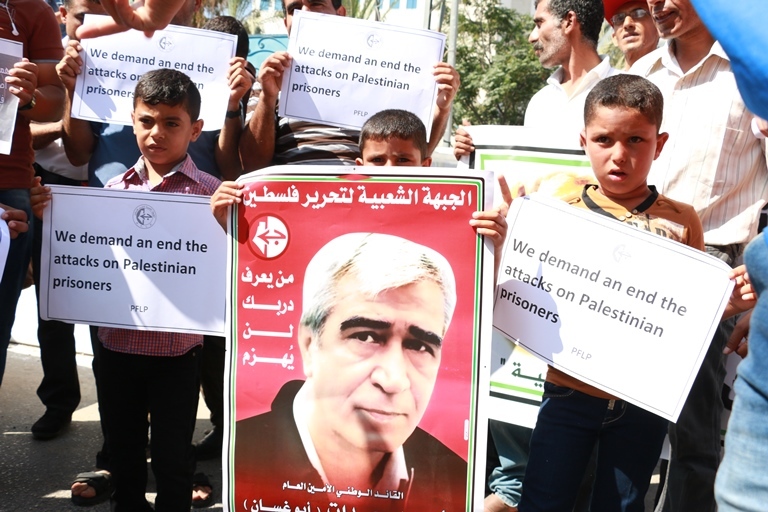 I send my warm greetings to you, with the most beautiful words and sincere declarations of pride, respect and appreciation, in my name and in the name of my comrades in the Popular Front for the Liberation of Palestine prison organization. These sincere words reflect our unity of thought and common suffering in the face of the tools of oppression and our common struggle for a better world in which the people regain their stolen humanity. I feel pain when you feel pain, and you are always a source of great pride and respect. From your principled steadfastness through decades in prison, we build our determination, our will and our intellectual conviction; from your head held high, always accelerating our steps to become nearer to the sun of truth and liberation, with you, by you, and with all of the forces of freedom in the world. Together, our strength is multiplied dozens of times, renewed in our hope and confidence in the inevitability of victory, the victory of daybreak over the night, the truth over lies and hypocrisy. You are a living witness to the falsity of the claims about the “free world,” “democracy,” “separation of powers” and “independence of the judiciary” of which the ruling class brags in media forums and lecture halls. We are chained by the common injustices manufactured in the United States of America, which are the same ones used in Palestine, and I do not doubt that there are many examples in all of the strongholds of imperialism.